The plan is to cycle around the Coast of Britain setting off in April 2010. The journey is around 4300 miles. I'm cycling unsupported - no van to carry the goodies, so I'm shopping around for the lightest kit that will do the job. 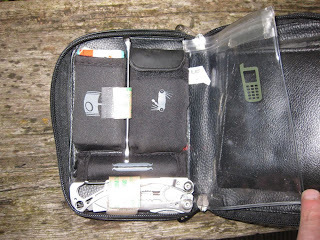 In this blog I'll review the kit as I pick it up for the trip and blogging daily once underway. I've added (at the bottom) a Leatherman Skeletool and (in the middle, edge on) a 7mm spanner. They're both retained with small sections of 3M Dual Lock - kind of like velcro but there is only one 'type' and it will stick to itself. Obviously added to that when out riding is phone, cash and cards. Unfortunately, if you like this toolkit and would like to follow suit, this 'large' Lezyne wallet that will hold an iPhone has been replaced by a smaller version. This is the 'Smart Wallet Elite' if you're searching for 'new old stock'. Every Rider should have a proper tool kit with him, it is one of the most important thing to keep with you..
'Proper'? Workshop tools are heavy. Many people spend a good amount of time and effort getting their ride as light as practical. Getting the balance right for an on-bike toolkit is challenging. The acceptable compromises depend on many factors including the remoteness of the location being ridden, the variety of fasteners on the individual bike and the weight the rider is willing to carry. I'm a cyclist currently hanging out with the lightweight backpacking crowd because they have the best lightweight camping kit that I need in order to keep down the weight of my cycle. The bike won't be ready until the end of the year so in the meantime I'll be day-hiking and, hopefully, backpacking to put the rest of the kit through it's paces. Hopefully the guys won't notice I'm faking it on the walking front!